The acacia tree isn't the first plant thought of for backyard landscaping because the unmistakable silhouette evokes images of Africa's sweeping plains, safaris and thrilling savannahs. But the rugged and graceful acacia is found across the globe - from arid to warm, tropical climates. Use it to add some elegance to the homestead. Heat, sand, and drought doesn't shake the confidence or tenacity of the sturdy acacia. Indigenous to Africa, Central America/Mexico and other subtropical areas, such as Australia (where they are called wattles), this tree (some species are shrubs) flourishes in Hawaii and the American Southwest. The tree is fast growing and famous for its intimidating thorns. While the acacia boasts a short lifespan, only 30 years, relative to other trees, it certainly adds curiosity - and function - during its tenure. Acacia trees (Mimosoideae) quickly reach heights of 20 to 40 feet. With dozens of species known worldwide, the trees sport telltale spear-like, pinnate leaves termed "leaf petioles". This shape is an adaptation the plant deploys to preserve moisture in the hot, dry climates the trees reside in. A few types have cladodes - thin branchlike shoots similar to a scotch broom in function and shape. Most species are evergreens sporting a range of blue-tinted foliage and exploding with a great display of rich yellow or off-white blooms in the winter or spring. The vibrant clusters resemble the heads of mums radiating down the branches. The blossoms are dense enough to weigh down the thicket-like limbs. The bloom's aroma is sweet and heady, reminiscent of licorice and vanilla. 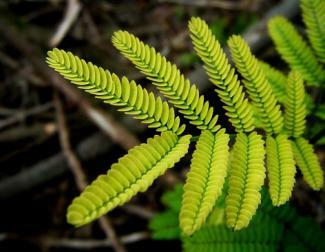 Acacias are planted for several environmental uses - and they serve each purpose with beauty. Whether grown for its fine grained wood, heady scent, healing resin or famous gum, the acacia is a true resource. A rugged and durable nature makes the acacia a first class erosion control plant for dry soils. The tree sets down a deep root system that can access water that seeped far under the top soil. This root system anchors the tree and creates a sturdy, soil stabilization structure. If critters are munching the landscaping, an acacia will close down the buffet. The leaves have an unpalatable taste for most animals and the branches ward off other creatures by brandishing infamous and substantial thorns. Some acacias are grown in orchards, but not all varieties offer food uses. The tree's sap is used as an edible adhesive and "tacky" acacia gum is found in food production and medicine. Texas Acacia or Prairie Guajillo - This fast grower is a native to the arid southwest and Mexico. It is rugged and drought resistant, reaching heights of 12 -15 feet with a compact, bushy growth pattern and a canopy of feather-like leaf structures. Expect a splendid showing of white flower clusters that emit a soft fragrance that permeates the air. Bloom time ranges from November to March. Willow Acacia - This unique variety echoes the lyrical and sweeping quality of a weeping willow tree - but with an unparalleled ability to shrug off drought. Growing shade trees in arid or desert climates is a challenge, but this Australian native, the willow acacia, awaits as the perfect solution to providing much needed shade against desert heat! The silvery blue foliage and silhouette of the willow acacia adds beauty and function to any southwest yardscape. 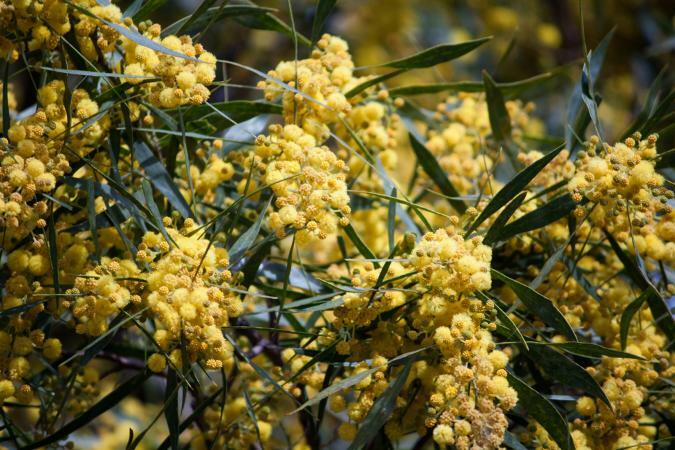 Bailey Acacia - This variety, also from Australia, can grow upwards of 20 to 30 feet tall. You'll find it blooms during the winter months with yellow flowers and shows off blue-gray leaves. Knifeleaf Acacia - The knifeleaf sports the classic acacia leaf "spear" structure - and that's reflected in its name. Diminutive at 9-16 feet, this tree makes up for size with beauty and fragrance. Irresistible nectary scented golden flowers herald in the spring. 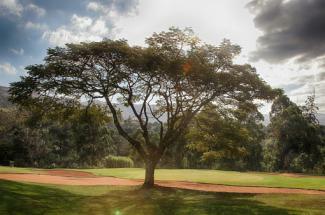 Koa Acacia - Hawaii is the proud home of this native American variety. This tree is impressive - its canopy bursting with yellow blooms in spring - the tree reaches the unusual height of 60 feet! In the right, tropical growing zones calling for a spectacular giant, this tree is the perfect selection. You don't need to do much with an acacia. These trees are built to be independent and will take care of themselves in the harshest, dry conditions. Less is always more with these plants. Fertilizer is not used and forget about additional water - save the buckets and hoses for other plants. Pruning tips - Simply prune away broken and dead branches. Trim off low growing limbs and suckers. Rake around the base of the tree to remove debris that can encourage pests or disease. Disease prevention and care - In fact, few diseases affect the acacia. Taking away the litter under the tree reduces the chance of the fungal infection, anthracnose, from hurting the tree. The disease is rare, but telltale signs include leaf-spotting and weakening of the plant. Consult an arborist and purchase a fungicide manufactured to treat anthracnose. Pest issues - Pests are few and rarely do any damage. If you notice the three common insects - whitefly, aphids, or thrip species - that will feed on the tree sap, you can administer a horticultural oil spray. 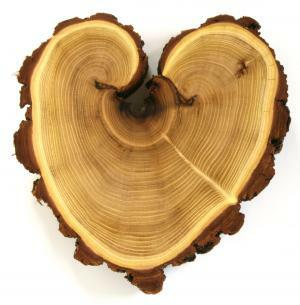 Healthy trees will not often require any treatment. For most cases, the insects can be dislodged by spraying the tree and leaves with a hose. Acacia trees come in a wide selection, and so do options for locating the plants. Seeds can be purchased from catalogues and online. Started seedlings are also available and are perfect for northern climates where the acacia must be wintered indoors or in a hothouse setting. In warmer climates, where acacias grow naturally, local greenhouses will have perfect selections for the locale, as well as being able to assist with any questions regarding this hardy tree's care. Visit a garden center to locate the right type of acacia, tree or shrub-type, for your unique needs. Plant the tree following the instructions for the variety selected. It's likely you'll need to water the tree more frequently to get it started but check with your local greenhouse about the specific variety selected. The name "wattle" is thought to refer to a type of fencing. 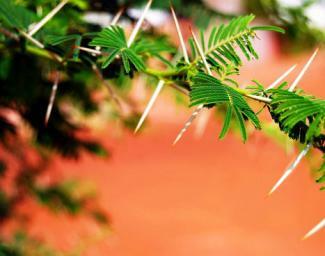 Since acacia branches are interwoven and substantial, they are regularly used as a thorny and effective "ready-made" barrier. 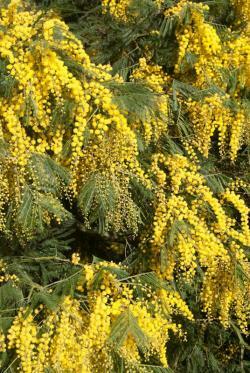 Use an acacia tree or shrub for privacy around your home's yard. Regardless of the final landscaping use, you're sure to enjoy this unusual tree.